The manager of the month curse struck as Brighton lost 2-0 at Everton. Here's six things we learned from the game. Albion travelled to Everton on the back of a seven-game unbeaten run but just didn't get going and were sunk by two second-half goals. Everton enjoyed the majority of possession in the first half and Albion's only effort at goal of note was a fierce strike by Glenn Murray which was pushed away by Jordan Pickford. The hosts went ahead when Gaetan Bong could only turn a Yannick Bolasie cross into his own net on the hour and Cenk Tosun then made it 2-0 with an emphatic finish 15 minutes from time. The day went from bad to worse nine minutes from time when Seagulls winger Anthony Knockaert was shown a straight red card for a late lunge on Leighton Baines. Brighton boss Chris Hughton was named Premier League manager of the month for February yesterday and, as is often the case, the curse of the award struck. Anthony Knockaert will rue a moment of madness which will see him miss Albion's next three matches. The French winger had a frustrating afternoon as nothing really came off and things boiled over ten minutes from time. After Leighton Baines accidently flicked the ball into Knockaert's face, the red mist seemed to descend and Knockaert flew into a studs-high tackle on the Everton left-back and was shown a straight red card by referee Roger East. With the international break after next week's match at Manchester United, Knockaert will not be available to play again until Albion's match at arch rivals Crystal Palace on April 14. Dale Stephens had played every minute of every Premier League game heading into today's match but missed out on playing at Goodison Park after picking up a knock in training. The midfielder has been a key part of the Seagulls' strong season to date and heading into the match had made the fourth most tackles of any midfielder in the top flight this season. He was also in the top 20 for passes and touches and joint sixth for clearances by a midfielder. He was replaced in midfield by Beram Kayal, who started his third league game of the season, alongside Davy Propper. With Stephens missing out, it's now just goalkeeper Mathew Ryan and defender Lewis Dunk who have played every minute in the Premier League for Brighton this season. Despite playing in a deep midfield role, former England captain Wayne Rooney showed his class throughout. He sprayed passes left and right - long and short - and always looked comfortable in possession. The way he kept hold of the ball helped Everton have 65 per cent of possession in the first half as Brighton struggled to string more than a handful of passes together. With Idrissa Gueye ruled out with a knock and Morgan Schneiderlin out of favour, Rooney linked up well with youngster Tom Davies in the middle of the park. The only blot on his copybook was having a late penalty superbly saved by Albion keeper Mathew Ryan. Shane Duffy and Lewis Dunk were again excellent at the back for Albion, so will be bitterly disappointed with the goals Everton scored. Duffy had spoken in the week about how much much he was relishing playing at Everton for the first time since he left the Toffees in 2014. The Irish defender again starred as he headed away several corners and crosses and, like Dunk, threw himself in front of several Everton shots. However, the Toffees went ahead on the hour when Yannick Bolasie cut in from the left and his cross went in off Albion defender Gaetan Bong, under pressure from Theo Walcott. It was far too easy from an Albion point of view and Everton put the game to bed 15 minutes from time when Cenk Tosun crashed an shot home off the underside of the bar. Yannick Bolasie was a thorn in Albion's side throughout the game and caused the Seagulls defence all sorts of problems. The former Crystal Palace winger should have found the back of the net in the first half as he had a couple of glorious opportunities but he did set up Everton's first goal when he cut in from the left and delivered a peach of a cross. 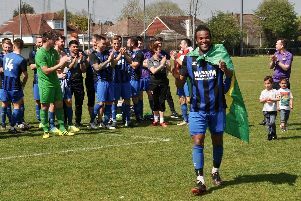 He was quick to turn to the Albion fans to celebrate as the ball went in, after the Seagulls supporters had taunted him with songs about his connection with Crystal Palace. Chris Hughton had no complaints with the red card shown to Anthony Knockaert - and admitted he was surprised by his side's performance.